Custom solutions for marketers and printers. Connect your print and other visual media marketing to the web and gather information about your potential or existing clients while personalizing your marketing to the individual. 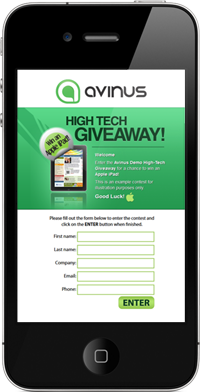 Our custom, mobile-friendly PURL/QR sites provide a tailored experience and gather user feedback to augment your mailing list, touch base with past clients or maximize cross-media effectiveness. Continue reading below for features, or check out the demo! Integrate a QR code into your marketing and the mobile-friendly site which users view on their smartphones and tables will track the number of visitors who arrived by QR code versus standard URL. Provide additional product information, direct users to your primary website, gather user feedback and more. Personalize the URL for each person or campaign to present a unique, targeted experience. Incorporate Personalized URLS into your marketing to increase response rates and gather feedback, contest entries or survey data from your visitors. Track who visited the PURL and whether they filled in the form. Download all the entered data to import into your mailing list, database or analytics program. 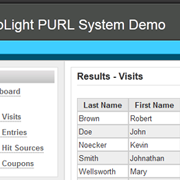 Each PURL/QR site is a fully customized mini, mobile-friendly website with our LampLight PURL system installed. Choose from a design to match your existing website or a brand new custom design. Use a new domain name or our free domain you-begin.com. We take care of the details so you can take care of business. Log into your dashboard to view and download your visitor data. It's quick, simple, and very user friendly. All entered visitor data is available at the click of a button. Download easily to Excel or other spreadsheet programs to create graphs, reports and more. Each new PURL site involves a small site creation cost and a minimal yearly hosting fee. No big software license fees to drain your budget. For more information and and example of how the LampLight PURL System works, view our demo PURL site and technical information. With no sign-up and no monthly licence fees, you don't pay a cent unless you make a sale. New PURL/QR site projects involve a very reasonable one-time project cost and a minor yearly hosting fee. Offer PURL or QR enabled websites for cross-media marketing to your clients with no commitment or financial investment. You only pay when you have an order. Change your mind about offering PURL sites to your clients? Stop reselling any time and you can keep your existing PURL sites up and running. Our system can track PURL, QR code or standard URL visits to the same site. Customize the design, content and any form questions with the flexibility of a full website. Most of our PURL/QR sites can be mobile friendly for no added cost. Apr, 2018 A new version of our MatchLight Decision Engine has been released! Copyright © 2019 Avinus. All Rights Reserved. Windsor, Ontario, Canada.